I'll be the first to admit, birding is not my thing. I have tremendous admiration and respect for Rich's dedication and boundless patience in pursuing his birds, and the amazing photographs that he captures. But he no longer asks if I would like to come along. He knows better. Loons, however, are a whole different matter. I spent several hours in the kayak today, cruising the calm water of the lake in the afternoon sun. 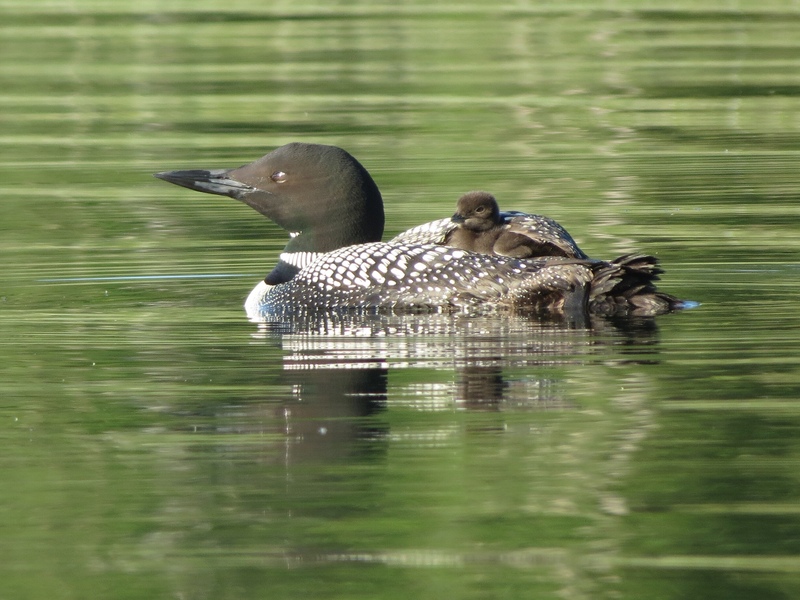 On my travels I spotted several loons with baby chicks. The fluffy little fledglings paddled behind mama, an entrancing sight. 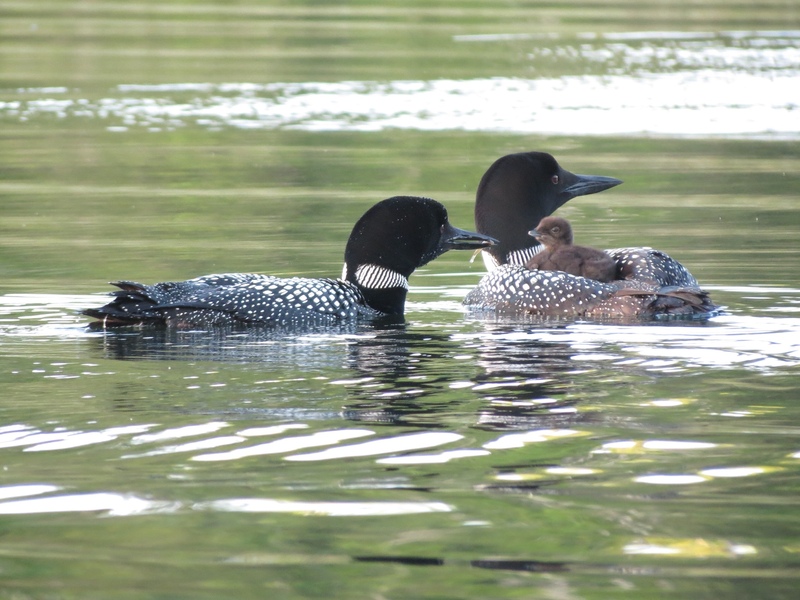 Rich was thrilled with my reconnaissance efforts, and was eager to photograph the young loons. Immedately following dinner he announced he was heading out in the boat to look for the loons. This time he asked, would I like to come? The answer came without hesitation. Yes! The sun dipping low in the sky lent a beautiful golden hour light to the scene. Evening's calm stilled the waters, and the waterskiers had been replaced by boats claiming their fishing spots. All was quiet on the lake. 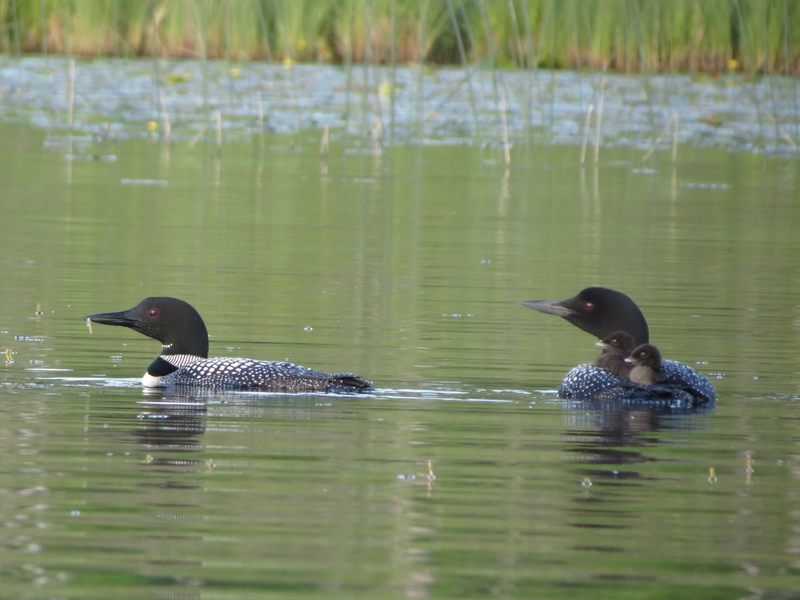 We found mama loon and her twins in the same bay where I'd seen them. At first, they were hidden in the reeds, but they soon obliged by swimming out into the open where they didn't seem to mind us watching. We could hear soft sounds made by mama to her chicks – something entirely new to me. Never before had I been close enough to hear their nurturing murmurs. Papa soon materialized and proceeded to hunt for dinner. He repeatedly returned with food to feed the chicks. We could tell when he was coming as he would swim under water but near the surface, creating a v-shaped wake above him. By this time the chicks were nestled on mama's back, well situated for papa to bring them tasty treats. As we watched, a chorus of frogs suddenly broke into song, croaking mightily around the bay. It was magical witnessing nature in the warmth of the setting sun. There is something deeply compelling about loons. From their haunting cries to their mottled black and white coats, they are are undeniably special. It is an honor to share our lake with them. I never tire of their majestic presence. I may not be a birder, but I'm always game to go looning. 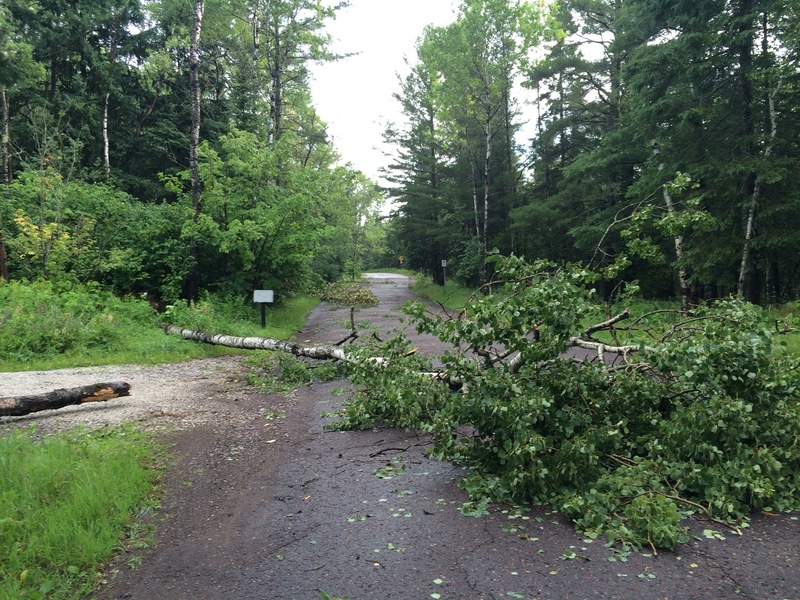 It's been almost four weeks since the storm raged through Duluth. Waking in the early morning hours to blinding lightning, constant thunder and howling winds did little to prepare us for the devastation that we would find when dawn came. And even then, we couldn't even imagine the true extent of the damage. We were among the fortunate. With just three moderate sized trees down in our yard, only our driveway was temporarily blocked. But heartbreak was only a short distance away. 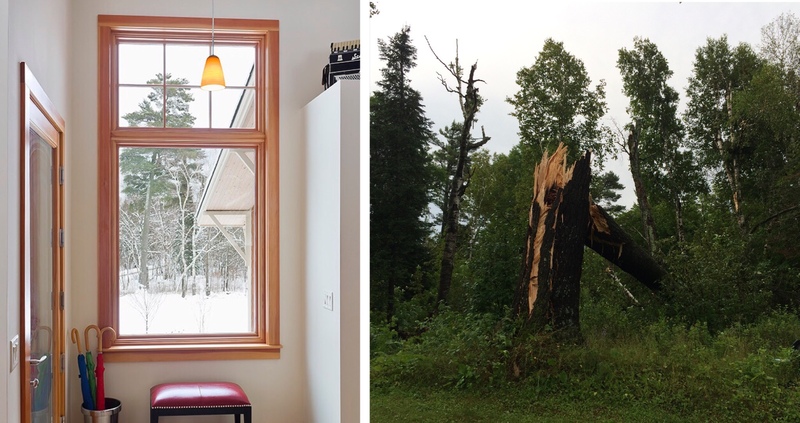 Our neighbors lost several venerable old trees, including our very favorite pine tree that dominated the skyline and was perfectly framed in our window. In its place we saw only jagged shards where the trunk had snapped, sending the majestic tree down into the woods below. A bike ride around the neighborhood revealed further ruins. Everywhere I looked there were downed trees – in yards, on houses, clobbering fences, blocking streets, dragging down power lines. The strangest site was a tree that had been launched 50 feet across a yard to pierce the roof of the house and exit through the end wall. And yet, the apples on the tree below had its produce blown to the ground in the opposite direction. By now, many of us have returned to life as usual. But the landscape is forever changed, and the massive clean-up effort continues. Sometimes that comes in unusual forms. And I shouldn't have been surprised when our neighbors topped that list. Enterprising, outdoorsy, optimists and just plain good folk, they turned their misfortune into opportunity. She calls it “making lemonade.” He calls it building a sauna. The big red portable lumber mill appeared on the lawn early in the morning. And so did a couple of operators. Soon the trunk that was once that big old pine tree made it onto the bed of the mill, and the cab passed back and forth turning it into planks and posts. It made for marvelous entertainment as I sipped my morning coffee on our deck. One of these days, when the sauna heats up and steam releases the pine smell, that giant of a tree will be immortalized. It seems very fitting. For in the process of cutting it into logs, they managed to count its rings. 240. It started growing the very year our country began. I am in awe. I always knew it was a special tree. I just didn't realize how special. It took a mighty storm with winds over 100 mph to bring it down. I will miss its dominating presence in our window. But I'm glad to live next door to folk who are engineering a way for it to live on. Farewell old towering pine. 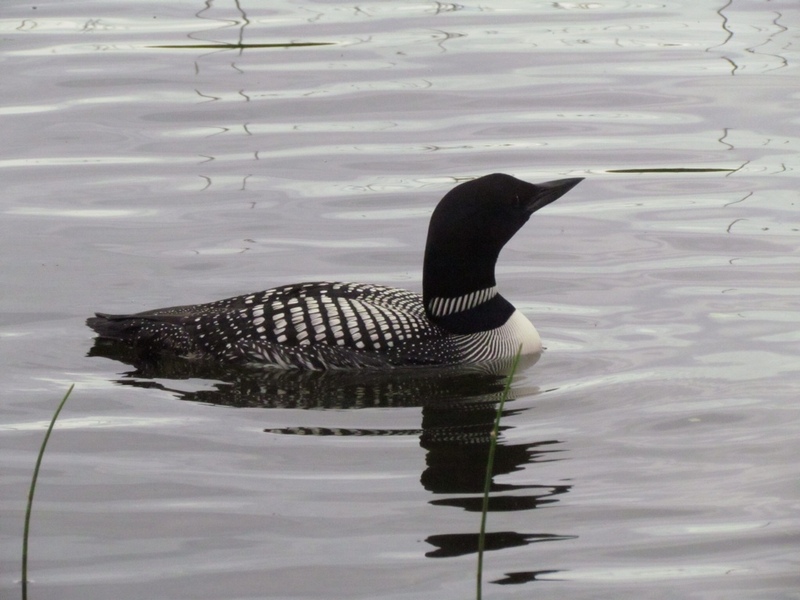 It's one of my favorite things at the cabin – seeing loons and hearing their plaintive cry. Sometimes I can get fairly close to them when out in the kayak. But ultimately they always dive and swim away, surfacing far off in any direction. 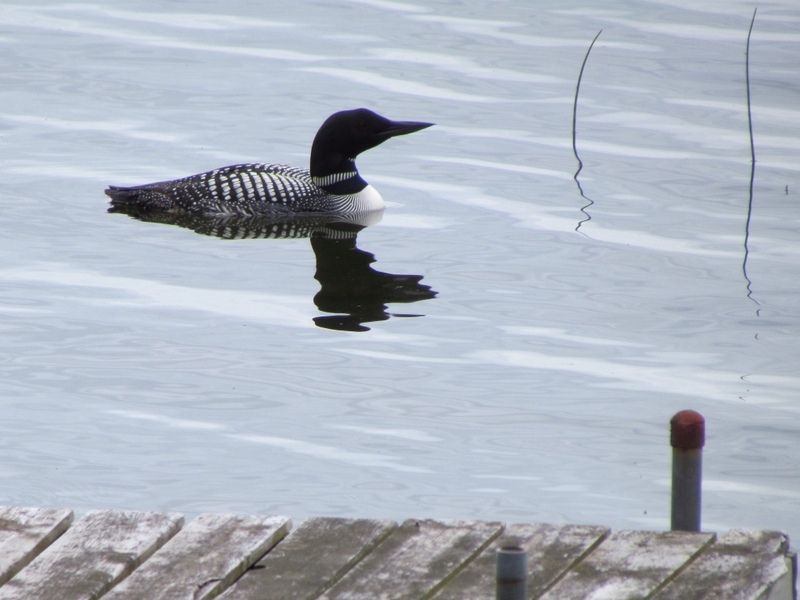 So imagine my surprise this morning when we saw a loon paddling languidly at the end of our dock. Knowing how skittish they are, I set up my camera and monopod on the deck of the cabin. I was afraid that getting any closer was likely to drive him away. 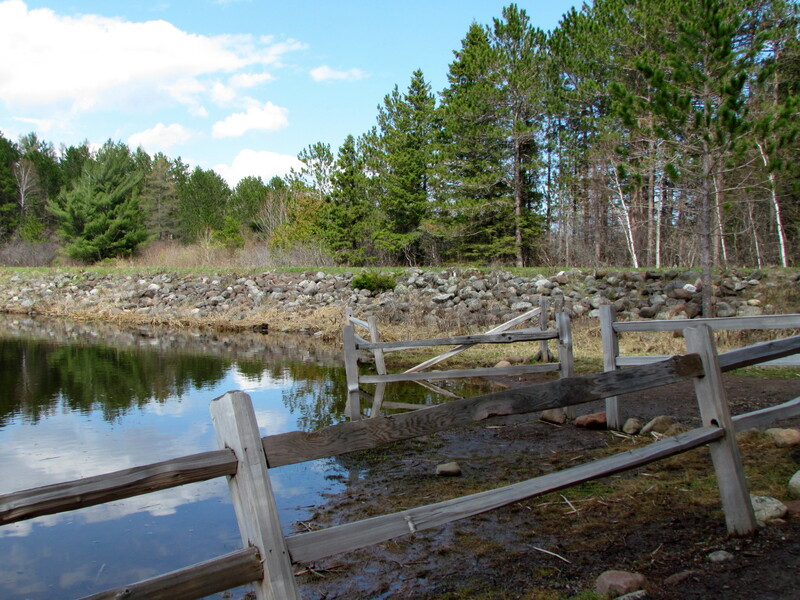 But after snapping a multitude of photos, I ventured halfway down to the lake, and eventually right onto the dock. Still Mr. Loon lingered. Swimming slowly back and forth, he seemed to accept our presence, even when Katie and Erik joined me. He wasn't fazed by us in the slightest. Eventually the loon swam away. But he left us knowing we'd seen something special. 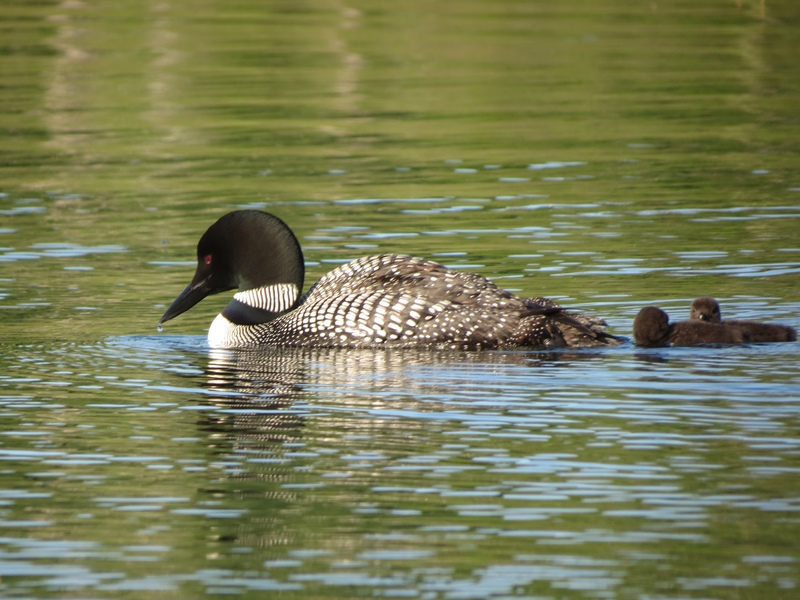 Thanks for the visit, Mr. Loon! It’s been so drab for so long. It didn’t help to wake up to dense fog, which obliterated all surroundings, brown or otherwise. My morning run took me up to Hawk Ridge, where nature defied all knowledge of Lake Superior or even houses below. With my senses screaming for stimulation, I went out on a mission to find color. Knowing I’d need to get away from the lake to lose the fog, I headed up to Hartley Park. Getting out of the car I could already tell the difference – the sun that had finally emerged packed some real warmth, and it wasn’t long before I was shedding layers in the welcome heat. The hunt was already off to a good start. My primary mission was to find wildflowers. That meant sticking to trails that were more out in the open, in the hopes that I would find a microcosm of spring where things were blooming. What I found instead were nascent blades peaking through the fall’s dead grasses, ferns beginning to take form and little else. I realized I might have to lower my expectations, and look for color in other forms. Reaching Hartley Pond I found a peaceful scene. There a lone loon dove and surfaced in the calm waters. I gradually became aware of the birds singing in the trees and the sounds of nature surrounding me. I decreed that the blue of the sky reflected in the pond, surrounded by the green trees qualified as color. Moving on, I was glad for my hiking boots as I slogged through wet and muddy terrain. 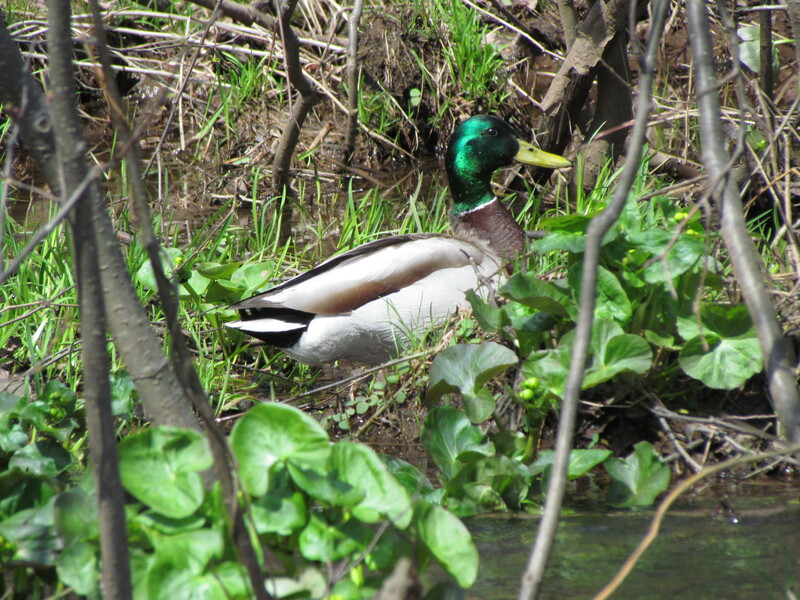 In following one of the little streams, I spotted the shiny green head of a mallard. He cooperated long enough to pose for me, and I decided to chalk another one up for spring color. I marveled at the fascinating plants growing alongside the stream, with their bulging balls bobbing above the leaves. And then I saw them – flowers! 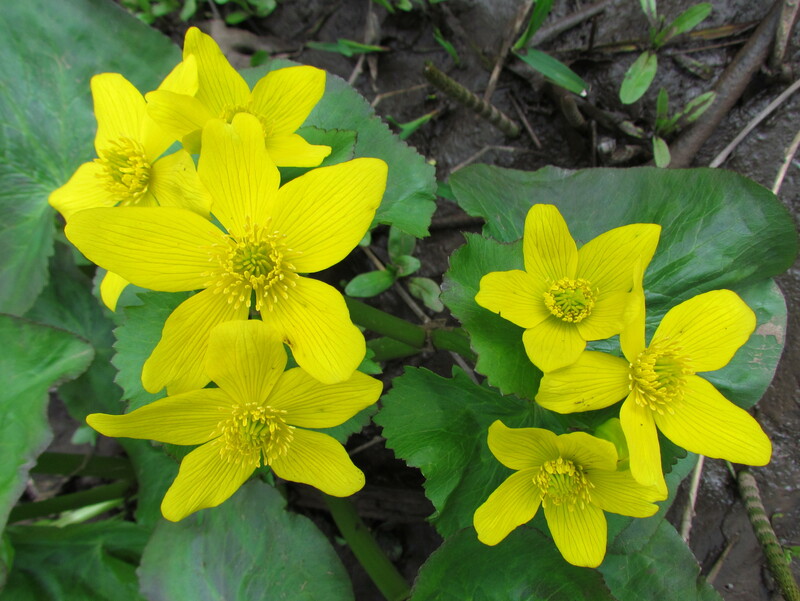 They were Marsh Marigolds, and I found one – and only one – that was in full boom! My first wildflower of the season, glowing in a radiant yellow and brightening my day. I could finally declare success. And if one wild flower is in bloom, surely others are soon to follow. I can’t wait for the explosion of color. What do you get when you cross a passion for photography with a life-long love of birds? 365 Days of Birds – my husband Rich’s latest project. It’s a year long challenge he created for himself, dedicated to photographing a bird a day. As a fairly new amateur photographer, his intent was to use the assignment to improve his photography skills. Now we are 61 days into the project. Yes, we. For although it’s Rich’s project, it has a habit of spilling over into my life as well. All the way out to Colorado and back, he scanned the skies. After all, he had to get his bird for the day. Then there are the pre-dawn ventures, hoping to get that golden hour light on his birds. Or the spontaneous photo opps on our way home from church. I never realized this project would be so all-consuming. But I will also grant that he has gotten some amazing photos. Although Rich has frequently invited me to accompany him on his bird hunts or other photo shoots, I don’t often go along. I’ve learned that I just don’t have the dedication, patience and persistence that it takes to get the perfect photo. Nor do I have much staying power in the bitter cold – a staple for photographers in northern Minnesota. So I accept my limitations and pursue my own passions. Writing in the warmth of our lovely home, with a big mug of steaming coffee nearby suits me quite well. 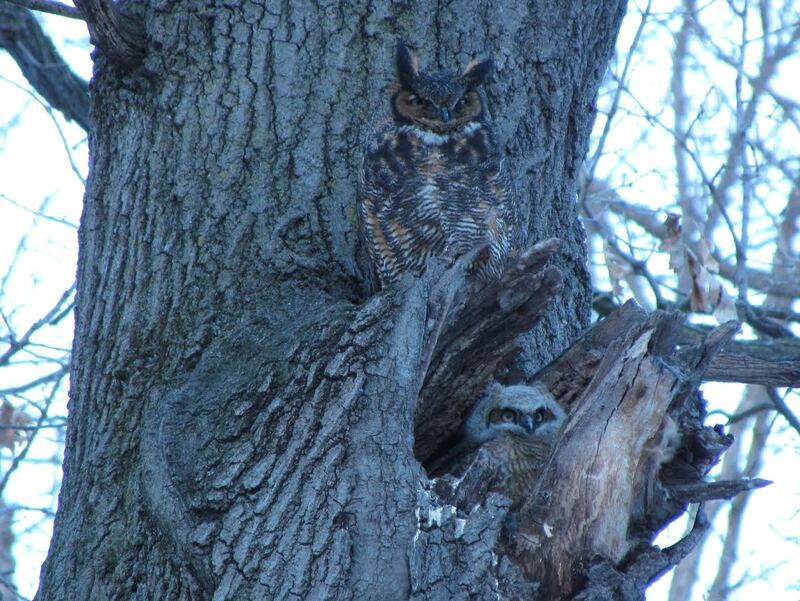 This evening I must have let my guard down, as I agreed to accompany Rich out to see a Great Horned Owl and her owlets in a nearby park. Armed with my own camera and tripod, I set up shop next to Rich and promptly photographed the dead stub of a branch on the tree. A nearby photographer with a foot-long lens on his camera kindly set me straight, and it became clear just how well camouflaged Mrs. Owl was. And peering at the display on the back of my camera, I could just make out the owlet. To the naked eye, both were nearly invisible. Somewhere overhead, father owl perched invisibly in a tree. I couldn’t see him at all until he swooped down and flew overhead to a distant grove of trees. From there, he traded hoots with Mrs. Owl and baby owlet turned to the sound of his voice. That was really cool. Unfortunately, so was I. As the cold seeped through my jacket and my fingers turned to useless stiff appendages, my interest waned. Still, I was glad I’d seen them and hoped I’d gotten at least one decent photo. So now I ask, what do you get when you cross a fair weather wanna-be photographer with a natural reverence for majestic creatures? One Day of Birds.